Turns out Stephen Colbert's not the only late night host on the cover of a major national magazine this week. 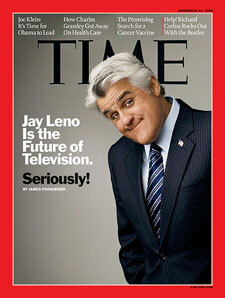 Jay Leno is "the Future of Television. Seriously!" according to Time's Sept. 14 issue. The article, by James Poniewozik, says that the major networks, "like the automakers whose commercials once lavishly floated them — must learn to get smaller or else end up like American Buggy Whip Inc."
If the Leno experiment succeeds, "it suggests a TV future in which ambitious dramas become the stuff of boutique cable, while the broadcasters become a megaphone for live events and cheap nonfiction," writes Poniewozik. "'If the Leno Show works,' says former NBC president Fred Silverman, 'it will be the most significant thing to happen in broadcast television in the last decade.'" Big words from the man who greenlit "Supertrain"! There aren't any real revelations in the combination think piece/interview for people who have been following the story for months now, although I like this tongue-in-cheek quote from Conan O'Brien when asked about Leno's strong first-week lineup: "My plan is to have a van that says 'The Jay Leno Show' pick up his guests and drive them here," said O'Brien. "It could be 15 minutes before Robin Williams realizes what's happening." The article also reports that NBC "says it's committed to airing The Jay Leno Show five nights a week for at least two years, good ratings or bad," and ends with Poniewozik noting that the show could be "a footnote, or it could make its host bigger than ever." (In his defense, he notes in his blog that the fact that the article wound up on the cover is "proof that the week before Labor Day is the slowest news week of the year.") The web site also includes a behind the scenes video of Leno's Time photo shoot, giving viewers plenty of glimpses of the new set (looks like there are lots of "10"s, in case you forget what time it is while you're watching!). Is there a reason for the 10s other than the time? You know, because it will be on at 9:00 here. For the record, I counted at least five 10's on the set tonight -- along with one tiny acknowledgment that the show airs at 9 in many parts of the country (on the movie marquee in Jay's backdrop).